“Winter’s Bone,” which was directed and co-written by Debra Granik, was one of nine nominees for an Academy Award for best motion picture of 2010. Granik was also up for an Oscar for best adapted screenplay (with co-writer Anne Rosellini). “Winter’s Bone” tells the story of a teenage girl struggling to survive in the drug-infested Ozark Mountains while searching for her missing father. The movie won the prestigious Grand Jury Prize for Drama at last year’s Sundance Film Festival. Granik’s first feature-length film, “Down to the Bone,” won the Sundance Dramatic Directing Award in 2004. Michael Goldman and Susan Hills Goldman ’84 marked their 25th wedding anniversary on April 12. 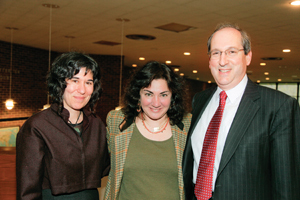 Filmaker Debra Granik ’85, who became interested in film as a tool of political activism as an undergraduate, returned to campus for a screening of her Oscarnominated “Winter’s Bone.” Granik (left); event organizer Alice Kelikian, history professor and chair of the Film, Television and Interactive Media Program; and President Fred Lawrence joined a standing-room-only crowd. The Edie and LewWasserman Fund co-sponsored the event.